The Toronto-area group sounds like the perfect blend of Depeche Mode and The Cure. 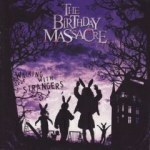 Before everyone got their knickers in a knot about a group like Shiny Toy Guns, there were synth-goth-rock bands like The Birthday Massacre hanging around the outer edges of music circles. The Toronto-area group makes the best of this album with a large, catchy and solid batch of tracks. Although “Kill the Lights” is a great song, the sweetness of the song pales compared to the ensuing pieces. A song like “Goodnight” is another keeper as the band’s lead vocalist Chibi works wonders over arrangements that mix the best of The Cure, Depeche Mode and NIN. However the group hits a David Ortiz-like home run with the synth-saturated “Falling Down” which makes one want to buy the DVD for Pretty in Pink and watch it repeatedly. The first tune to really show a harder, rougher side is the industrial-influenced “Red Stars” but even then The Birthday Massacre takes a light, airy route during the verses. Other songs such as “Looking Glass” don’t one-up earlier efforts but certainly aren’t embarrassing or filler. Perhaps the highlight of the latter tracks is the rich and tender “To Die For” that sounds like the perfect blend of Depeche Mode and The Cure. The same can be said of the atmospheric and grandiose closer “Movie”.